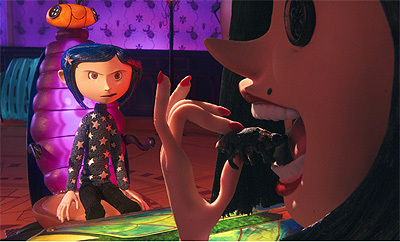 Editor’s Note: In this review film critic Joe Strike gives us a sneak preview into the upcoming film Coraline which comes out on February 6th. The moment we left Disneyland in 2003 my son regretted not buying the hoodie that was on sale in the Nightmare Before Christmas gift shop in the park – so much so that once we were back home I phoned the park and mail-ordered it for him. He wore the damn thing to death, then cut Jack Skellington out and sewed him onto a new hoodie, which he also proceeded to wear to death. 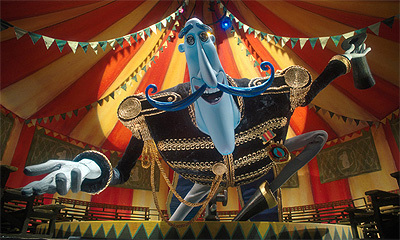 Chockfull of dream imagery and dream logic, it follows Robert Potemkin (portrayed by a live actor), in ‘real life’ tormented by evil, stop-motion conjoined twin girls. But when summoned to a ‘lower dimension’ (and transported there by a quintet of telekinetic lizards) he becomes ‘Slow Bob,’ an animated cut-out who saves a community of snapshot people from an invasion of flying scissors. In his first feature, Nightmare Before Christmas, skeletal Jack Skellington of Halloween Town invades Christmas Town and makes a royal mess of Santa’s holiday before setting things straight. In his second James and the Giant Peach, a young boy crawls into the heart of said fruit, turning into a stop motion replica of himself to travel across the ocean with a band of sentient insects. Are you seeing a pattern here? A series of Alices in not-quite Wonderlands? Sure, Nightmare, Peach and Coraline are based on the works of others (Burton, Dahl and Gaiman), but when the same person is drawn to, and works and reworks similar material – you’re dealing with an artist. He might be spending tens of millions of dollars of other peoples’ money to work through his obsessions, but he’s an artist nonetheless. 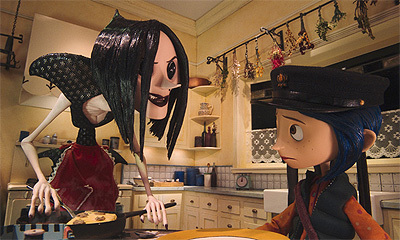 Burton co-directed The Corpse Bride with one of Selick’s animators; that film too took a trip to an underworld, the land of the dead – but it just didn’t have the same swing, the same zing as Selick’s work. Warning: Be prepared for some embarrassingly racist stereotypes from back in the day. Selick has the advantage of digital technology that does the sculpting for him and compositing tools that hide whatever seams might otherwise be showing – but all that’s stuff for the DVD commentary track and bonus features. Just see the damn film: the magical stuff is breath-taking, the scary stuff is super-creepy (it’s PG, but leave the youngest young’uns home). 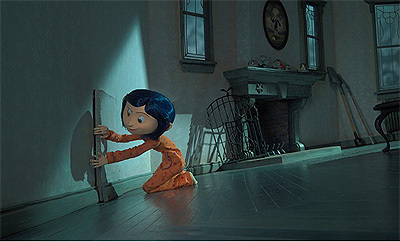 Coraline is 2009’s first animated feature, but for my money (if I’d paid to see it, which I will the next time) it already has a lock on one of next year’s animated feature Oscar noms. Joe is an occasional animation scripter and freelance NYC writer covering animation and sci-fi/fantasy entertainment. His work has appeared in the NY Daily News, Newsday, the New York Press and, as they used to say on Rocky and Bullwinkle, ‘a host of others.’ He is a regular contributor to the animation industry website awn.com, but it’s much easier to visit joestrike.com to see what he’s been up to lately.